Carl Caneva, the city’s assistant director of the health department, speaks in front of city staff Monday. Officials met at the first Human Services Funding Summit meeting to discuss better ways to allocate funding to public services. 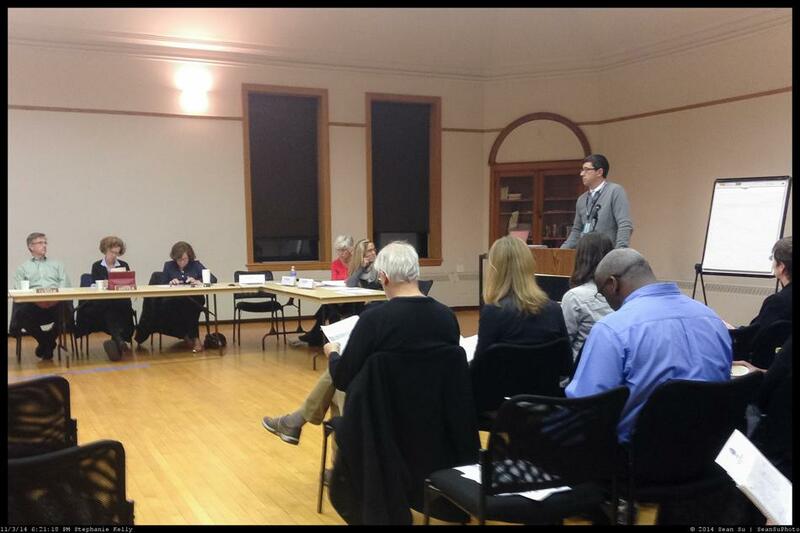 City officials discussed Monday revising the funding allocation and application process for two grants that support Evanston agencies and social services. Members of the Human Services Committee, the Mental Health Board and the Housing and Community Development Act Committee came together for the first Human Services Funding Summit meeting. Led by Ald. Coleen Burrus (9th), the Human Services Committee chair, they considered different ways funding for public services could be distributed more effectively. About $1 million per year from federal and city sources are allocated to the city’s various agencies and social services, Burrus said. She noted the summit was held in part to identify ways to better distribute the funding. “There’s no way that amount of money can address all the needs in the community,” Burrus said. Burrus proposed a universal application available for groups to request funding from both the Community Development Block Grant and the Mental Health Board, an idea that some agency representatives agreed with. The block grant, a U.S. Department of Housing and Urban Development grant, works to provide more opportunities to low- and moderate-income residents. Evanston can use up to 15 percent of the grant specifically for public services, said Sarah Flax, the city’s housing and grants administrator. A universal application would make allocating grants easier for the funders and the requesting agencies, Burrus said. The panelists agreed to look into Burrus’ suggestion. Ald. Delores Holmes (5th) voiced concern about the pressure to allocate the money in a way that includes everyone, even when some groups receive a very small amount of funding. She asked whether awarding a small amount of money is worth it when the paperwork for agencies to apply for funding is so long and time-consuming. “I think that this needs to be part of the discussion, as well, that we need to make a difference with these dollars,” Holmes said. However, during time for comment, some agency representatives tried to dispel Holmes’ concern. The small portion money from the city helps to encourage other donors to provide additional funding, said Ann Rappett, who represented the Child Care Center of Evanston at the meeting. “We can show that if the city supports us, it really makes a big difference,” she said. Allison Stark, a chair of the Mental Health Board, said some organizations feel they need to have an “in” in the city in order to receive funding, since the same group of agencies receive funding year after year. There should be more transparency in the funding application process, she said. The city holds multiple meetings discussing the block grant throughout the year that get little attendance, Ald. Ann Rainey (8th) said, noting there is an empty room 90 percent of the time. The recommendations that came from the meeting will go in front of the Human Services Committee in December, at which time there will be a motion to recommend them to council, Burrus told The Daily. In January or February, there will be a summit for setting goals.